Remember that big bottle of Campari I had to buy when I posted my Italian Greyhound cocktail? Well, it’s time to drag it out of the liquor cabinet for a bunch of Negronis to celebrate the arrival of Spring. A Negroni is such a pretty cocktail especially when it is served “up” in a stemmed glass with a garnish of orange peel. That’s exactly what my friend, Mary Constant, ordered when we shared a drink or two last November, in a beautifully paneled bar in San Francisco. She sat down and announced, “I know exactly what I want”, a very Mary kind of remark. Mary is a hard-working, fun-loving, adventurous woman who I met through the food52 site over five years ago. She lost her beloved husband Freddy just about a year ago, and has spent the year working so hard, running their winery atop of Diamond Mountain in Calistoga, Napa Valley. Take a look at the site for Constant Diamond Mountain Wines to enjoy its incredible location and breath-taking scenery. Larry and I were fortunate to stay as guests a few years back, in their vintage farmhouse that is now the guesthouse. The Negroni - Happy Spring! A campari-based cocktail to celebrate Spring's arrival. Combine Campari, gin and vermouth in a cocktail shaker filled halfway with ice. Shake, pour, add garnish and serve. 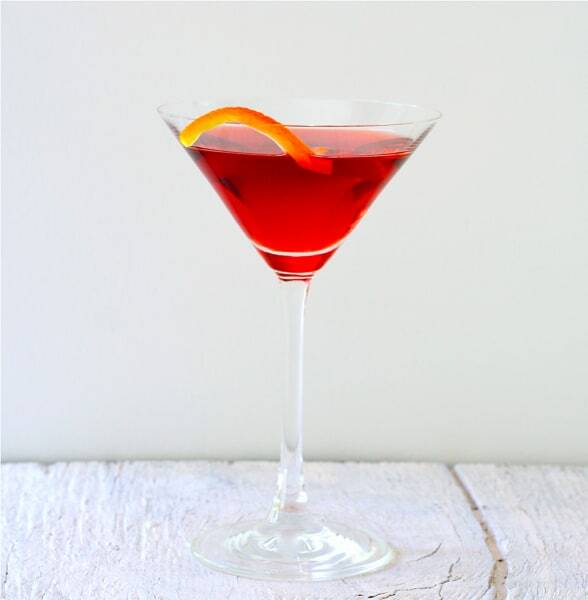 20 Responses to The Negroni – Happy Spring! It was a terrific reunion, Susan. My Bay Area food52 friends mean so much to me. Thanks, Greg, I really wanted to salute my friend. I just wrote “campari” on my grocery list. I still have a huge bottle, Dorothy – come to San Diego and we can celebrate – unable to make Camp Blogaway this year. Lovely tribute to Mary. And what a gorgeous cocktail indeed! Thanks, Wendy – reading about your strawberry season in Florida inspired my next post, I think. Let’s share one this summer, Ani! What a nice tribute and a beautiful looking cocktail! Thanks, Jayne, sorry for the delay – jury duty kept me busy. Right back at ya’, Liz. That photo is making me thirsty! I can’t decide if I’m ready for a cocktail or a second cup of coffee! This is lovely Liz – the cocktail and the tribute. I hope to raise a glass with you in person some time this year! It’s a pretty cocktail but I’m not in love with Campari yet – yes, we shall meet up!